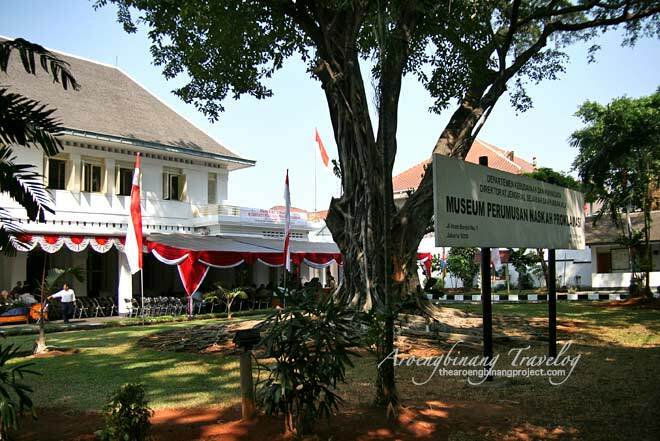 Museum Perumusan Naskah Proklamasi Jakarta (Formulation of Proclamation Text Museum) is located at Jl.Imam Bonjol 1, Jakarta, adjacent to a corner building after Taman Suropati, past the statue of Prince Diponegoro, on direction to HI roundabout. Formulation of Proclamation Text Museum occupies an old Art Deco building which was established in 1920. The Formulation of Proclamation Text Museum, built on a land area of ​​3914 m2, was used by BNI Life Insurance in 1931, by Admiral Tadashi Maeda during the Japanese occupation, headquarter of the British Army after the Pacific war, and was used again by the BNI Life Insurance, the British Embassy 1961-1981, and National Library in 1982. When it was used by Admiral Tadashi Maeda, the building of Formulation of Proclamation Text Museum witnessed a historic event on 16 - 17 August 1945, when the formulation of proclamation text was prepared and signed. In 1984, Prof. Nugroho Notosusanto, Minister of Education & Culture, officiated it as Formulation of Proclamation Text Museum. Facade of Jakarta Formulation of Proclamation Text Museum. In here, Soekarno, Hatta and Ahmad Soebardjo was greeted by Tadashi Maeda around 10 pm, on August 16, 1945, after returning from the Rengasdengklok "abduction". Sukarno, Hatta, and Maeda then met Major General Nishimura to explore his position of the proclamation of independence plan. Nishimura said the Japanese could not change status quo as it had surrendered to the Allies, thus Nishimura prohibited PPKI's meeting for the Declaration of Independence. Soekarno - Hatta concluded there was no use talking about independence with the Japanese. They just hope that the Japanese would not obstruct the implementation of proclamation. Soekarno and Hatta then returned to Maeda's home. Maeda's home was chosen as the place for preparing the proclamation text because Maeda gave assurance of safety to the Soekarno and other figures in attendance. Maeda himself then went into his bedroom on the second floor when the historic event was taking place in the house. 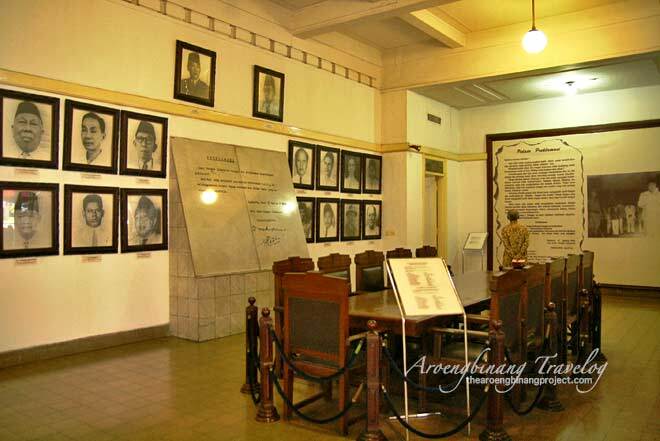 A room in Formulation of Proclamation Text Museum where at 3 am, Legi Friday, August 17, 1945, in the month of Ramadan, Seokarno, Hatta and Soebardjo formulated the proclamation text. Soekarno wrote the script, Hatta and Soebardjo gave advice orally. Miyoshi, Nishimura's right-hand man, stood watching together Sukarni, Sudiro, and BM Diah. Other figures waited on the front porch. The first sentence of the proclamation text was suggested by Ahmad Soebardjo from formulation of Committee for Preparatory Work for Indonesian Independence, and the last sentence was suggested by Hatta. Sayuti Melik then typed the proclamation text on Sukarno's request, accompanied by BM Diah. Sayuti made three changes to the text, those were "tempoh" to "tempo", "representatives of the Indonesian nation" was changed to "On behalf of the Indonesian people", and date format was also changed. In the room corner of Formulation Museum visitors can see Sayuti Melik statue sit in front of a typewriter, adjacent to BM Diah statue. The main room of Formulation of Proclamation Text Museum in where all figures who were present at tha time gathered here after the text has completely typed. At 04.00 am, August 17, 1945, Sukarno opened the meeting, and then read slowly and repeatedly manuscript of the proclamation text. All those present in the meeting agreed. "The state of urgency has forced all of us to accelerate the implementation of the Declaration of Independence. The draft text was ready to be read in front of you brothers, and I truly hope that all of you brothers can give your approvals so that we can move on and complete our works before dawn", said Soekarno. Sukarno suggested to jointly sign the the proclamation text as representatives of the Indonesian nation. The suggestion was supported by Hatta with the example of United States Declaration of Independence. However, youth group leaders refused if the elderly figures who were referred as "slaves of Japanese" co-signed the text. It was Sukarni who then proposed that the signatories of the proclamation text was only done by two people, namely Soekarno and Mohammad Hatta, on behalf of the Indonesian nation. Sukarni proposal was finally accepted by all attendees. Soekarno and Hatta was then put their signatures on a manuscript that had been typed by Sayuti Melik. Presented at the meeting were Soekarno, Hatta, Ahmad Soebardjo, Mohamad Amir, Boentaran Martoatmodjo, I Goesti Ketut Poedja, A Abbas, Iwa Kusumasumantri, Johanes Latoeharharry, Ki Bagoes Hadji Hadikoesoemo, Teukoe Moehammad Hasan, Ki Hadjar Dewantara, Otto Iskandardinata, K.R.T. Radjiman Wedyodiningrat, Soetardjo Kartohadikusumo, R. Soepomo, Soekardjo Wirjopranoto, G.S.S.J. Ratulangi, BM Diah, Sukarni, Chaerul Saleh, Sayuti Melik, Anang Abdoel Hamidhan, Andi Pangerang, Andi Sultan Daeng Radja, Semaun Bakry, Soediro, Abikoesno Tjokrosoejoso and Samsi Sastrowidagdo. After that there was a discussion to determine the place. Sukarni said that the Jakartans and its surrounding areas had been called to come to Ikada Stadium on August 17 to hear the Declaration of Independence. But the suggestion was rejected by Soekarno. "No," said Soekarno, "it's better done in my residence in East Pegangsaan. Courtyard in front of the house is spacious enough for hundreds of people." "Why do we have to provoke an incident? Ikada Stadium is a public square. A general meeting, without prearranged with the military authorities, will likely to cause misunderstanding. 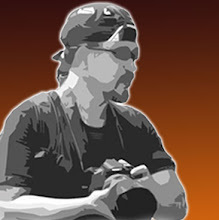 A violent clash between the people and the military authorities would disperse the rally, likely to occur. Therefore, I ask you all to be present in East Pegangsaan 56 around 10:00 am . " Before leaving Maeda'home, Hatta advised the youth to work on the press and news agencies to reproduce the proclamation text and spread it all over the world. In the Jakarta Formulation of Proclamation Text Museum was attached transcript of short speech of Sukarno before reading the text of the Proclamation and his closing remarks. Deputy Mayor, Soewirjo, ask Wilopo to prepare microphones and loudspeakers. Sudiro ordered S. Suhud to prepare flagpole. Suhud found bamboo at the backyard of Soekarno's house, cleaned it, gave it rope, and planted a few steps from the porch. He did not know that in front of the house'Soekarno there are two flagpoles made of iron. The flag sewn by Fatmawati was prepared. 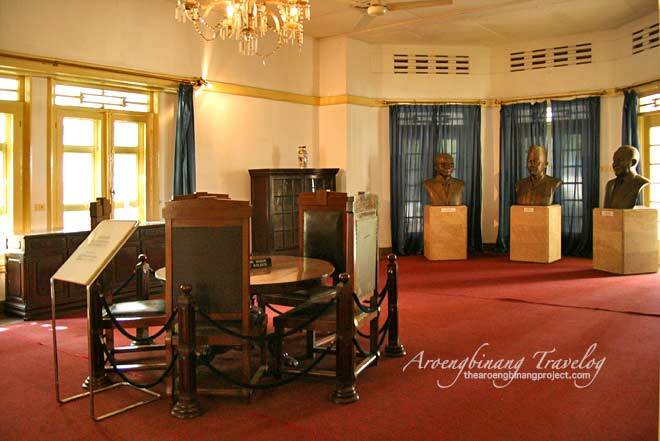 Sukarno's house that morning was filled with leaders of struggle, a number of youths and common people. As it's getting closer to noon and the proclamation had not been read out, the youths urged Sukarno, who was sleeping after having fever since last night, so that the proclamation be done immediately. But Sukarno refused to read the proclamation text without the presence of Hatta. Five minutes before the event started, Mohammad Hatta came with a white-and-white suit and picked Soekarno in his room. Soekarno got up from his bed and then dressed in a white-and-white suit as well. The two then headed to the home patio. The rest was history. 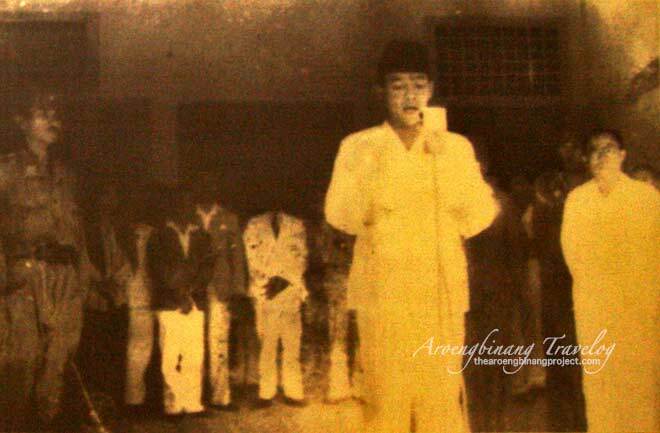 Photo documentation on a poster that shows historical moments when Sukarno, wearing a white suit and trousers, was reading the proclamation text that was formulated in the early hours before. Mohammad Hatta was standing to the right of Bung Karno, and other leaders were a little far behind. The house on Jl. East Pegangsaan 56 was torn down at the behest of Sukarno himself, and on the text readout was erected Lightning Monument that is now in the complex Soekarno - Hatta Monument. Various collections of old photos and posters were stored on the second floor of Formulation of Proclamation Text Museum, depicting historic events between 1945-1950. There's also a bust statue of I Goesti Poedja Ketut, who got the title of National Hero on November 10, 2011. I Goesti Ketut Poedja was born in Singaraja Bali on May 19, 1908 and died in Jakarta on May 4, 1971. In addition known to be active in the movements for national independence of Indonesia, he also had served as governor of the Lesser Sunda. The Jakarta Formulation of Proclamation Text Museum is a historical sights in Jakarta, excellent to be visited by the whole family members to commemorate the exciting and historic moments before the proclamation of independence that became the starting point for changes that determine the fate of the entire nation of Indonesia.